As you know, the Chamber of Automotive Manufacturers of the Philippines (CAMPI for short) will be staging the biennial Philippine International Motor Show this week--September 14 (Wednesday) to 18 (Sunday), to be exact. And because this car show is organized by the industry's principal association, it has traditionally become the one event that offers the most interesting mix of show vehicles. Big carmakers wanting to upstage each other certainly helps. For this year's event, the biggest car company of them all--Toyota Motor Philippines, of course- will be reeling in show visitors with the help of a futuristic concept car we all know as the FT-1. 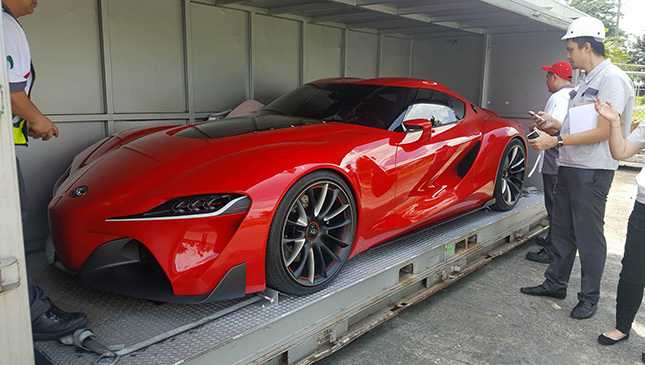 Yep, the video-game-worthy FT-1 is in the country, and you will get the chance to take selfies with it at PIMS this week. The photos you see here were taken by TMP marketing's Uzzi Asuncion at Toyota's headquarters in Santa Rosa, Laguna, this morning, as it was being prepared for transit to the show venue. As we write this, Asuncion informs us that the car is already in Pasay City awaiting ingress. The FT-1 isn't necessarily new. Toyota, in fact, debuted the car at the Detroit Auto Show back in 2014. But damn, it would still drop more jaws than the newest supercar on the market today. And we promise you: The FT-1 looksmore impressive in the metal than in photos. We think this baby single-handedly makes PIMS a must-not-miss event. PIMS 2016 will be held at World Trade Center in Pasay City. The price of admission is P100, which, to be honest, is extremely reasonable considering the array of nice cars on display. See you there!